From 23rd to 26th December 2015, Shree Muktajeevan Swamibapa Pipe Band, Nairobi - Kenya celebrates its 60th anniversary. 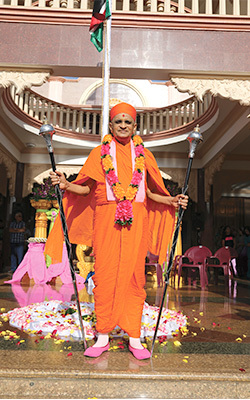 Acharya Shree Purushottampriyadasji Swamishree Maharaj, spiritual leader of Maninagar Shree Swaminarayan Gadi Sansthan, has inspired a festival that includes a city parade where the Nairobi Band will be joined by its sister bands from UK, USA and India to perform as a mass pipe band. Many thousands of people from all around the world will also attend these celebrations. My disciples must attend the Mandir every evening, where they should sing devotional songs in praise of the Lord. On special celebration days, the singing of the Lord’s praises should be accompanied with the playing of musical instruments. Explaining the siginificance of music in one’s life, Acharya Swamishree Maharaj says, “Music is a means to reach God. It has a considerable influence on one’s mood. In addition, a lot can be learnt through music and song. Even a wild animal can be tamed by music. It is therefore an extremely powerful medium.” He therefore advises disciples to use the art of music for the benefit of others. True music is that through which the bliss of God can be experienced. The sentiments of devotion and prayer should remain foremost in music and song. Music is not an easy skill to acquire. It requires a lot of hard work and dedication. Proficiency in music is a highly valued skill. When dance is combined with music, its effect is amplified. Music and song are the best and simplest means of becoming close to God. Jeevanpran Shree Muktajeevan Swamibapa was a talented musician Himself. He would play the tabla drums whilst the young students of the boarding school danced and sang devotional songs. The sound of Jeevanpran Swamibapa’s beats being played on the tabla or mrudang drums would entice everyone to join in the devotional dancing. Just as Lord Shree Swaminarayan taught His Sants the art of music, Jeevanpran Swamibapa also encouraged His Sants and disciples to learn and to play various musical instruments and sing devotional prayers. 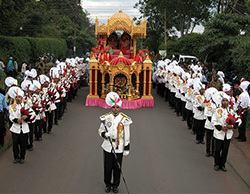 Aligning with His direction for betterment in life, Shree Muktajeevan Swamibapa Pipe Band – Nairobi, Kenya was formed.